With the rising cost of fuel, it is essential that your boilers operate as efficiently as possible. All Climate Mechanical will service your boiler by performing a thorough ‘Boiler Tune Up’ at an economical cost. 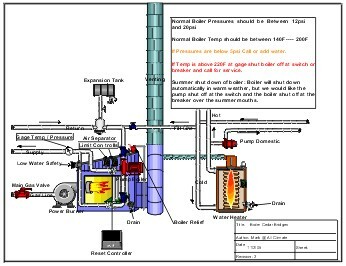 Testing and adjusting your boilers combustion to maximize your heating capacity while reducing your energy consumption. Recording any problems found on your system and offering you the correct solutions to ensure a safe, economical operation each season. If you are experiencing these symptoms, seek medical attention immediately. Carbon monoxide: Code often allows 400 parts per million (ppm). But to be safe you would not want to see any more than 150 ppm. A reading above 150 ppm would be a red flag to double-check the combustion. High levels of carbon monoxide suggest that there is not enough oxygen for the amount of fuel being burned. Or, conversely, there is too much fuel for the amount of oxygen. High carbon monoxide levels also indicate that there is not complete combustion and that fuel is being wasted. Depending upon the appliance, you can generally adjust air, fuel or both. If you find high levels of carbon monoxide, either increase the oxygen or decrease the fuel until you find safe carbon monoxide measurements in the flue. A combustion analysis is the best way to determine if your boiler is running properly. Having this analysis performed in conjunction with a boiler tune up may even qualify you for a rebate from your natural gas provider. Most natural gas utility companies will pay a rebate every other year for a boiler tune-up. Carbon monoxide: Code often allows 400 parts per million (ppm). But to be safe you would not want to see any more than 150 ppm. A reading above 150 ppm would be a red flag to double-check the combustion. High levels of carbon monoxide suggest that there is not enough oxygen for the amount of fuel being burned. Or, conversely, there is too much fuel for the amount of oxygen. High carbon monoxide levels also indicate that there is not complete combustion and that fuel is being wasted. Depending upon the appliance, you can generally adjust air, fuel or both. If you find high levels of carbon monoxide, either increase the oxygen or decrease the fuel until you find safe carbon monoxide measurements in the flue.